Custom Beverage Services works with our premier partner Micro-Matic, the country’s #1 beer system manufacturer. We are a Micro-Matic Certified Installer, only installing top quality draft beer components and work in Manchester, NH and all throughout New England. Some of the draft beer equipment we sell includes: draft beer towers, custom beer towers, draft beer faucets, glycol cooling systems, draft beer line bundles, gas blenders, high-pressure regulators, low-pressure regulators, beer pump systems and foam on beer detectors. We service all size draft beer systems in Manchester, NH – large, small and everything in between. As the draft beer market evolves and the micro-brew market expands, the demand for larger, more profitable draft beer systems also grows. Draft beer system management is a critical component of a large beer system. We install many different configurations of “off the shelf” draft beer towers but really pride ourselves on building custom beer towers. A custom draft beer tower can not only be the showpiece of an establishment but can also help with system efficiency and in server efficiency. A draft beer system is a large profit center for all bars and restaurants. It is our goal at Custom Beverage Services to install and maintain your draft beer system to a standard that both maintains the brewer’s product and maximizes profit for your establishment. 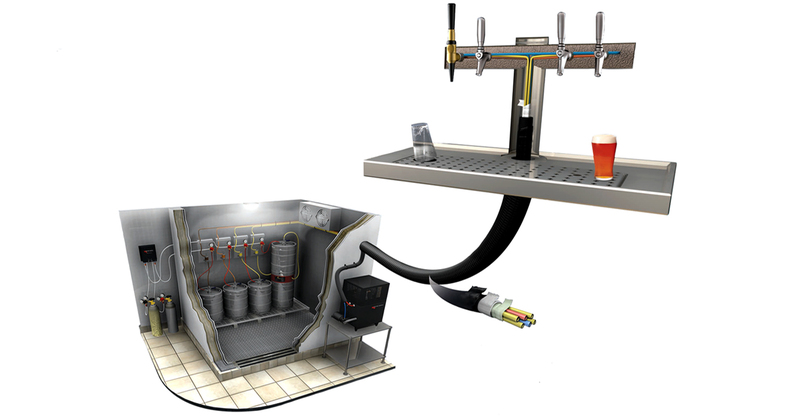 Installing a profitable beer system involves many considerations like; beer line size, gas blend calibration, glycol cooling capacity and ease of use. A key element of a system installation is educating our clients in the proper operation of their beer system. We offer training for any size establishment, this aids the client in maintaining good pour practices and guards against over-pour and waste. Please contact us to evaluate your existing draft beer system. Visit us on Facebook @ facebook.com/CustomBeverageServices.